Drawing on politics, religion, law, literature, and philosophy, this interdisciplinary study is a sequel to Mark Fortier’s bookThe Culture of Equity in Early Modern England (Ashgate, 2006). 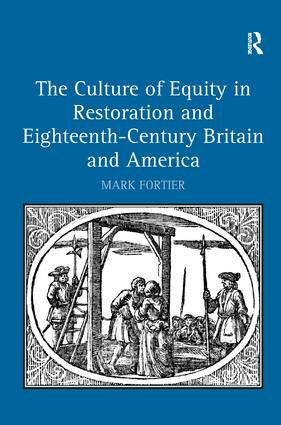 The earlier volume traced the meanings and usage of equity in broad cultural terms (including but not limited to law) to position equity as a keyword of valuation, persuasion, and understanding; the present volume carries that work through the Restoration and eighteenth century in Britain and America. Fortier argues that equity continued to be a keyword, used and contested in many of the major social and political events of the period. Further, he argues that equity needs to be seen in this period largely outside the Aristotelian parameters that have generally been assumed in scholarship on equity. Mark Fortier is Professor of English and Theatre in the School of English and Theatre Studies at the University of Guelph, Canada. He is the author of The Culture of Equity in Early Modern England and Theory/Theatre: an Introduction; and co-editor of Adaptations of Shakespeare and Royal Subjects: Essays on the Writings of James VI and I. He has an LL.B from the University of Toronto, Canada.